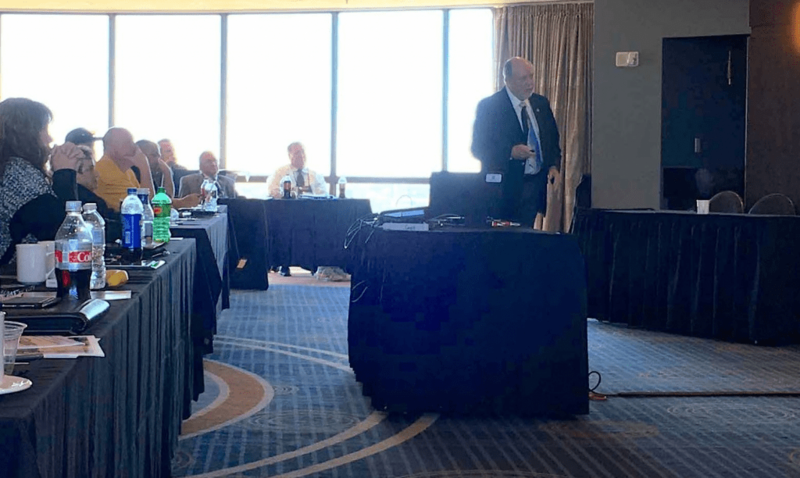 NASDPTS Past-President Ron Kinney shared California Highway Patrol school bus crash statistics before and after seat belts were mandated in the state. 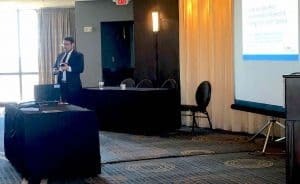 KANSAS CITY – Attendees at the National State Directors of Pupil Transportation Services Annual Conference heard and discussed studies examining the positive impact that seat belts have on student behavior, performance and driver retention. A Sunday afternoon presentation by Matthew Palmer, researcher and program manager of school planning and transportation for the Institute for Transportation Research and Education at North Carolina State University, focused on a school bus seat belt study he administered for the National Highway Traffic Safety Administration. Palmer explained that the study found having seat belts on school buses had more than just the obvious safety benefits. After his presentation, Ron Kinney, a past-president of NASDPTS and a retired state director at the California Department of Education, shared data on the effects of seat belt usage. “When we talk about the benefits of seat belts of course we think about the rollovers and crashes, but there may be a larger opportunity here that we haven’t thought of,” Palmer said. He revealed that his team’s research found seat belts kept student safer, improved their behavior both on the bus and in school, and assisted with school bus driver retention. The two biggest events that have increased federal interest in the subject of school bus seat belts were NHTSA going on the record in support of the occupant restraints in 2015, and supplier development of three-two seating to address a loss of passenger capacity, explained Palmer. In addition to looking at data, he told the NASDPTS members, NHTSA wants to also hear real-life experiences and receive input from them and their districts. The five key things needed for any successful implementation, he said, were placement (or which buses get the belts), a required use policy, enforcement, driver responsibilities, and community buy-in. Matthew Palmer shared results of a NHTSA school bus seat belt study with NASDPTS on Oct. 28, 2018. Palmer related that the study he had led in North Carolina’s Guilford County Schools focused on rates of compartmentalization compliance, or how many students stayed in their seats. When comparing 31 buses with lap-shoulder belts to 31 without them, the seat belt buses had a 9-percent higher compliance rate. However, since there was no enforcement policy, the numbers evened out within months. They also studied Durham County Schools in North Carolina, which not only implemented lap-shoulder belts on its buses, but also instituted an entire student management program which included the belts. This had a much better effect on student behavior. Instead of punishing students by moving them to the front of the bus for not wearing the belts, students were given the incentive of picking their own seat if they did buckle up. Keeping kids calmer on the bus also gets them to school in a better frame of mind to learn, he added. Additionally, there must be community buy-in to a seat belt program, both from within the district and from the community. Palmer said his contact at the Durham County transportation department confirmed that it was important to obtain principal and school administration buy-in. But it goes beyond just getting approval to add the equipment to buses. “Putting belts on buses helps—requiring kids to use them is another matter,” Palmer stated. To help with this, drivers must be instructed to require their use and be empowered to enforce the rules. He advised that helping drivers understand that lap-shoulder belts are a tool and not just another trouble spot that they have to monitor. Another discovered benefit of this approach to seat belt usage was that the driver’s job was simplified, giving them better job satisfaction and thereby increasing retention rates. Palmer played video showing that the noise level went down when everyone was belted it. “It’s much quieter, so it’s less distracting for the driver,” he noted. Helping drivers enjoy their job more lowers turnover, so it is desirable from a cost-benefit standpoint. The Guilford County study found that older students were less likely to wear the belts, as other student transporters have also said. In Durham County the demographic was different, so parents either did not have cars or did not make their kids buckle up if they did, so there was a need for more student training. In answer to attendee questions on how seat belts affected student injuries and their academic achievement, Palmer confirmed that NHTSA is interested in studying such effects, but must get district buy-in to research it. He added that NHTSA gleaned insight and information from Tom Cohn, director of transportation for Helena Public Schools in Montana, and Monica Coburn, a retired director of transportation for multiple districts in Indiana. They both successfully added lap-shoulder belts to their fleets. Palmer also cited assistance from previous and current North Carolina state directors, Derek Graham and Kevin Harrison, respectively. After Palmer spoke, attendees heard from Kinney, who presented data from the state’s 14-year history with seat belts in all school buses. California’s lap-shoulder belt statute went into effect in 2002. In 2004, small school buses manufactured or sold in the state were required to have the three-point restraints, and the same requirement followed the next year for large buses. Kinney explained that he started looking at the data collected over the years in 2015. California Highway Patrol statistics were available for years before and after the seat belt requirements went into effect. There was a 5-percent reduction in total school buses over 16 years, but during that time the state also eliminated all but special education routes. The most impressive statistics, and the ones that he said surprised him the most, showed a 57 percent reduction in school bus passenger injuries after the belts were mandated. Crashes in which the school bus driver was at fault also dramatically decreased by over 75 percent over the last 20 years. Attendees agreed with Kinney that these numbers indicated that drivers were less distracted by students who were buckled into their seats and could therefore focus on the road and their driving. In fact, Kinney said, drivers don’t even have to look up at their mirrors since the kids are contained in their compartments.